One of the last lights to convert to LEDs are my rear turn signals. 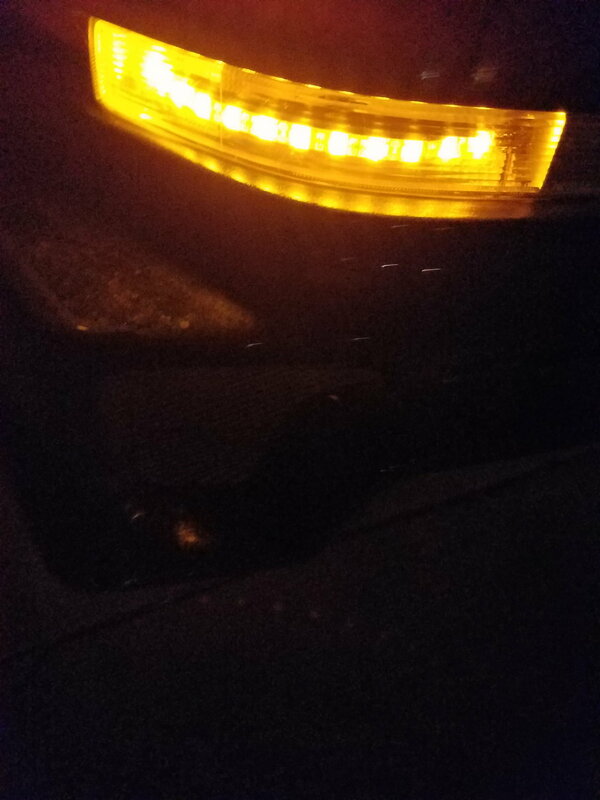 All my other exterior lights are LEDs other than the headlights which are HID. LEDs look more modern, draw much much less current then their incandescent counterparts, and pretty much last a lifetime. 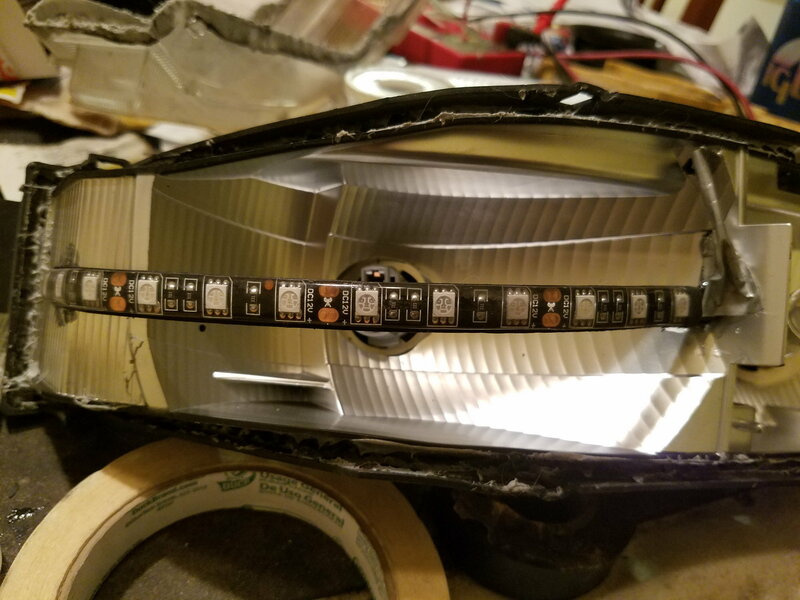 This DIY LED rear turn signal conversion cost about $10 for the LED strips and about $15 for the load resistors for a total of about $25. Pre-made LED turn signals are well north of $100 and some even over $200. I know some of them do some fancy things like switchbacks and sequential signaling, but I wanted to give the rear signals a factory look. I have the OEM Nismo coupe rear bumper but removal of the bumper is probably the same for the regular bumper. I actually did not remove the bumper but just did one side at a time so the whole bumper did not have to come off but I could have remove the bumper. There are plenty of instructions online as to how to do it. First remove the tail light. Pop off 3 caps and a 10 mm socket will have the three bolts removed and disconnect the connector. The taillights then pull away from the body. Then I remove just the corner of the bumper to give me access to the turn signal housing. The turn signal housing is held in by two phillips screws on each end of the housing. Remove the two screws and disconnect the connector and wiggle the turn signal away from the car. This is the fun/scary part. Pre-heat your oven to about 225 degrees. Put a piece of thick cardboard on the rack and you are now going to bake the signal housing for 8 minutes. Put on your leather work gloves and remove the turn signal housing from the oven. I just used a small flat blade screwdriver and pried the housing apart. If it does not come apart, you may need to put it in the oven longer. pull out the amber colored bulb and set it aside. I left the bulb plug in place to keep the light housing waterproof. My idea is to bridge the space where the old turn signal was and continued it around the corner of the housing. For some reason Nissan did not have the corner of the housing function in the turn signal. My LED signals wrap all the way around and are much more visible from the side in addition to the back. I found some thin plastic sheet, I think 1/16", that I had laying around. I cut a strip of the plastic and shaped it to the size of the LED strip which is 8 in Long. Then I use a heat gun to curve the plastic to the shape of the turn signal housing curve. 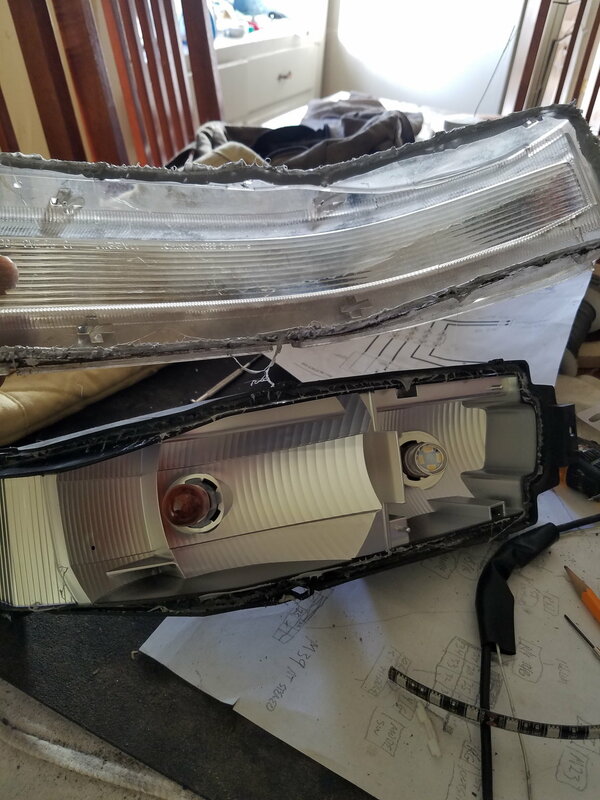 I cut a slit in the middle of the turn signal housing so that the plastic strip would fit inside and then I used to party poxy to glue down the one and that is around the corner and I applied the epoxy to the slit where the plastic strip went in. I clamped down the one end and waited for it to dry. Quick dry epoxy works great. then I cleaned the surface of the bridge really well with alcohol and then remove the backing of the LED strip and apply the strip to the bridge. Of course you want a flexible strip. 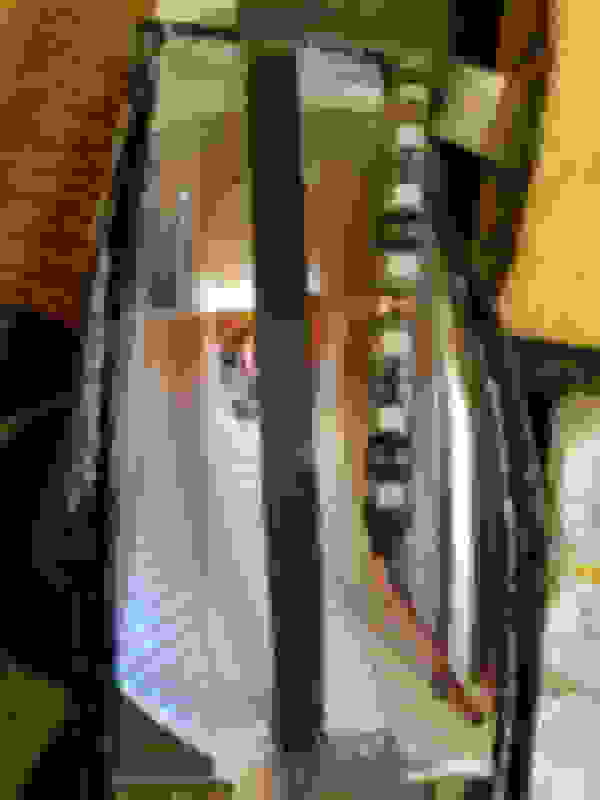 I covered the wires in silver duct tape so that it would not be visible. I actually forgot to do this on one of the lights. Oh well. I drilled a small hole above the and where the wires feed into the LED strip and weaved the wires through that hole and then cut into the wires of the bulb socket and soldered the wires of the LED strip plus the load resistor to the bulb wires. I wrapped up the joints in electrical tape. my turn signal lenses were a bit cloudy so I use some Mother's metal polish inside and out to make the lenses look clear again. This really makes the lenses look great. I kind of screwed up the placement of the LED strip on the first light. A helpful hint would be to align the far end of the LED strip with the mounting hole and the other side of the LED strip goes in the very center. That way the LED strip is centered with the clear lens. My first one goes up a little bit because I didn't see where the clear lens went. Any questions or comments just let me know. I think this is a great mod and saves people a lot of money and it's not terribly hard to do. The concept is good, it just needs a little polishing. Have you considered 2 led strips, then adding something to cover up the area where the old lights are? LED Turn Signals & LED Dome Lights!! !